f The Bugbytes: Your Heart will Flip Flop over Life is a Beach! Hi everyone! This is Bobbi Jo from SweetSassyDiva. I am the guest designer today for Tuesday Treats. This month we are using the Life is a Beach cartridge. The hardest thing is trying to decide what to make and the inspiration does not always come so easily. I sat down with my Gypsy and looked over the different images while thinking of what I might want to make for all of you. Then, I thought what would be better for Tuesday Treats than some treats! I looked at the different images on the Life is a Beach cartridge and thought I know.....I will make some cookies! YUM! Some of you might not know but, Mercy has been trying to enable me about the Cricut Cake since it was scheduled to come out the beginning of this year. Ok I must say she is not the only one trying to make me succumb to the Red beauty. I have held strong and have waited. The only thing that kept taunting me was cookies! I have two little ones that would love shape cookies and who wants to store all of those cookie cutter shapes? Although I guess you could use them to decorate your Christmas Tree or adorn your kitchen wall but, I just don't need all those cookie cutters in my house. Plus, that is less room for more Cricut cartridges! So, we will make some cookies that you will FLIP over! You can use your favorite rolled sugar cookie dough or you can use the Sugar Cookies recipe. Just make sure the recipe is for cut out cookies not just a sugar dough recipe. You want a recipe that will not rise much nor spread so, that it maintains the shape. Ok.....mix your dough. I hope you enjoyed the video and the tip on using the hide contour button with the upper left hand silver button. This is extremely useful especially for those little lines that are hard to get with your stylus alone. The recommended setting on the Cricut Cake to cut the dough is pressure 3 speed 3. Bake the sugar cookies according to your recipe instructions. Be careful transferring the cookies to wax paper to cool. They are hot and like to break or dent if you move them too quickly. Also, do not leave them too long or they might just stick to your pan. I like to bake my cookies on a pizza stone or you can also use a cookie sheet of your choice. If you are using a traditional cookie sheet, parchment paper helps that they don't stick to your pan. Nothing worse than making beautiful shape cookies only to have them not come off the cookie sheet! As you wait for the cookies to cool, you will use your Gypsy or your Cricut Cake unaided and cut out the fondant or as I did use the Cricut Frosting Sheets. The nice thing about fondant is that like cookie dough you can ball it up, roll it out and cut more from it. Unfortunately, the Cricut Frosting Sheets have a learning curve and can be temperamental. Furthermore, as you can see there is quite a bit of waste as you cannot ball it back up and use it again. In my house, that is not a problem though because I have a little one and a husband with a sweet tooth. To my son that is a definite SCORE!!!!! You can also cut them into bits and serve them as edible confetti on ice cream or other desserts. Follow the instructions on the back of the Cricut Frosting Sheets package for directions on how to use the frosting sheets. You will take a Cricut cutting mat and like I showed you in the video, grease the mat with Crisco or other solid shortening with a brush. This is your glue to hold the medium to the cricut mat to cut in the cricut cake. Place the medium on your mat, load it into the cricut and cut immediately. The frosting sheets dry out very quickly and humidity will affect them. As you can see above, the frosting sheets are not 12x12. You will need to plan accordingly in your Gypsy or move your arrow keys to begin cutting a bit in from where the medium is on the mat. On page 64, of the handbook for Life is a Beach, cut out the image using the white frosting sheet at 3.75". This will be the lining of your Sandal (flip flop). I cut this one out using the Gypsy image that we used for the cookie base hiding the lines of the strap. You could cut it out with the lines for the strap to use as guides but, I did not want to risk the frosting sheets tearing. As you do not see the lines after you layer it and this is not a complicated image, I just omitted the lines. Next, we will cut out the strap for the sandals. Press the "Layers" key and the key. This will be cut the same size as the base at 3.75", while making sure that the 'real size dial' is off. Note: the default setting is off. I cut this using the frosting sheets in green. After the cookies have cooled on the wax paper or parchment paper, you can assemble the cookies. You can use water to gently brush on the underside of the cookie, royal icing or frosting for your edible glue. I used some frosting to adhere my edible paper to the cookies. Next, I added the green strap to the base. You could also add some Wilton Pearl Dust or Sanding Sugar for some added sparkle, shimmer and bling! After you assemble all the cookies, you can put them on a plate or in your favorite glass bowl. I used a pedestal glass bowl lining it with brown sugar to give it a beachy sand look. As you can see, I made a submarine, flip flops in various sizes and a cute little bikini top and bottom. On the bikini, I used a red hot to adorn the top. These are great for a picnic on the beach, beach theme wedding or any party. I do not think that these cookies will last long because my family is ready to eat them all up. These would make the cutest birthday favors just wrap them up in those little cellophane bags with a bit of ribbon. Be sure to cut out the cute little matching tag that is available on this cartridge as well. 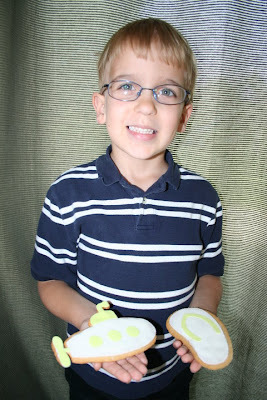 I just know that my son would have lots of kids wanting to trade with him at lunch with these adorable cookies! What a handsome young man he is becoming! Still LOVE those matching dimples! I hope you enjoyed the Life is a Beach cookies! I would be honored if you would follow Tuesday Treats as well as my blog SweetSassyDiva which you can see by clicking here! I enjoyed showing you how to make some cookies. I believe my son will enjoy them even more! LOL I think I will go make some picnic items and head to the beach! Perhaps, a cool tuna salad made with shell noodles to keep the beach theme going! Enjoy! Yummy, those look good. What a great idea. Great job. Thanks for sharing. Your son is a cutie. This is a great idea!! Thanks for your enthusiasm and for sharing this with us!! Love your blog, too!! Cute! What a great idea to make cookies! I never would have thought of that with this cartridge!